Tuesday – Long route in Terradets, Mescalina. 16 pitches, 450 meters. The route was hard, I will never in my life free the 7a crux pitch. Quite steep and an amazing amount of climbing! Great route but felt week all the way. Thursday – Bruixes. This sector is way too hard for me. Could try a polished 7a+ that I didn’t really enjoy. I’m just extremely un-motivated for polished climbs, no matter how good they are supposed to be. I will probably never go back to this sector even when I have the level. There are so, so many amazing non-polished sectors around and I will keep going to those. Saturday – Riugréixer. Excellent little area! Good place to climb when it is warm. Still felt weak so went there focused on belaying my Swedish friend and toproping a little. And that is basically what I did. 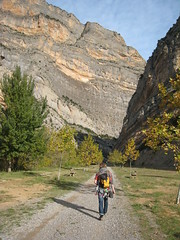 Could try the fiercely overhanging Febre Conillera again (broke a hold and took a big fall last time, probably bumping the grade from 7a+ to 7b). Too steep for me. Then a cool long 7a+ that I will try leading next time, much more my style! Sunday – Mont-ral. First visit to this classic climbing area, the second oldest in Catalunya. Full day of climbing. For the first time in a long time went to sport climb with the idea of doing a lot of easy routes. Warmed up on three 6a and for the first time in a month felt like I had some energy. Changed sector and could on-sight the two most classic routes in Mont-Ral, one 6c and one 6c+, both amazing climbs and fairly overhanging on the upper part. Great feeling but hurt my finger even more on the last climb of the day… not good. Not good at all.